For Russian footballer, see Yevgeny Aleksandrovich Nesterenko. Yevgeny Yevgenievich Nesterenko (Евгений Евгеньевич Нестеренко, born 8 January 1938), HSL, PAU, is a Soviet and Russian operatic bass. Hero of Socialist Labour was an honourary title of the Soviet Union and other Warsaw Pact countries. It was the highest degree of distinction for exceptional achievements in national economy and culture. It provided a similar status to the title Hero of the Soviet Union that was awarded for heroic deeds, but unlike the latter, was not awarded to foreign citizens. 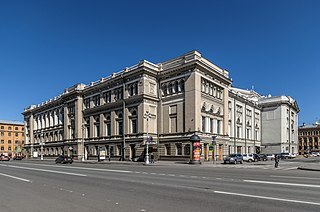 Mikhail Ivanovich Glinka was the first Russian composer to gain wide recognition within his own country, and is often regarded as the fountainhead of Russian classical music. Glinka's compositions were an important influence on future Russian composers, notably the members of The Five, who took Glinka's lead and produced a distinctive Russian style of music. Nesterenko's enormous repertoire ranges from deep bass to baritone parts in operas by classical Russian and West-European composers. His finest role is considered to be Tsar Boris in Mussorgsky's opera Boris Godunov , which won him the "Golden Viotti" medal in Italy in 1981. Kirill Petrovich Kondrashin, PAU was a Soviet and Russian conductor. Galina Pavlovna Vishnevskaya was a Russian soprano opera singer and recitalist who was named a People's Artist of the USSR in 1966. She was the wife of cellist Mstislav Rostropovich, and mother to their two daughters, Olga and Elena Rostropovich. Rodion Konstantinovich Shchedrin is a Soviet and Russian composer and pianist, winner of the Lenin Prize (1984), USSR State Prize (1972), and the State Prize of the Russian Federation (1992), and is a former member of the Interregional Deputy Group (1989–1991). He is also a citizen of Lithuania and Spain. Valery Abisalovich Gergiev, PAR is a Russian conductor and opera company director of Ossetian origin. He is general director and artistic director of the Mariinsky Theatre, chief conductor of the Munich Philharmonic and artistic director of the White Nights Festival in St. Petersburg. 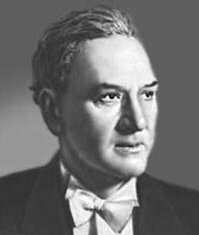 Osip Afanasievich Petrov was a Ukrainian operatic bass-baritone of great range and renown, whose career centred on St Petersburg. Irina Konstantinovna Arkhipova was a Russian mezzo-soprano, and later contralto, opera singer. She sang leading roles first in Russia at the Sverdlovsk Opera and the Bolshoi Theatre, and then throughout Europe and in the United States. Yevgeny Vladimirivich Kolobov was a Russian conductor. Konstantin Saradzhev was an Armenian conductor and violinist. He was an advocate of new Russian music, and conducted a number of premieres of works by Pyotr Ilyich Tchaikovsky, Modest Mussorgsky, Igor Stravinsky, Sergei Prokofiev, Nikolai Myaskovsky, Dmitri Shostakovich, and Aram Khachaturian. His son Konstantin Konstantinovich Saradzhev was a noted bell ringer and musical theorist. Sergey Alexandrovich Krylov is a Russian and Italian violinist and conductor. Vladimir Aleksandrovich Kobekin is a Russian composer best known for his opera compositions. Rodion Mikhaylovich Azarkhin also spelt Rodion Azarkin and Radion Azarkin, was a Russian musician. He started playing the double bass in 1945 at a music school next to the Saint Petersburg Conservatory. Later he was a pupil of RSFSR Honoured Artist M.M. 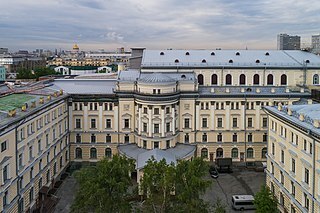 Kurbatov at the Leningrad Conservatory from which he graduated with honours in 1954. He continued his studies as a postgraduate student at the Moscow Conservatory under cellist Sviatoslav Knushevitsky. Nikita Storojev is a Russian bass opera singer. Lyudmila Stepanivna Shemchuk is a Ukrainian operatic mezzo-soprano. She is an Honoured Artist of the RSFSR (1984). Alexander Sladkovsky is the chief conductor and artistic director of the Tatarstan National Symphony Orchestra and has received the title of People's Artist of Russia. He graduated from Moscow and St.Petersburg conservatories. The orchestra was the first to be recorded by Medici.tv and Mezzo TV. From 2013, Sladkovsky is signed to Sony Music Entertainment Russia. Dmitry Stanislavovich Belosselskiy is a Russian operatic bass singer who made an international career. Mussorgsky's "Song of the Flea"